Posted on July 6, 2017 at 4:23 am. Dada Mail v10.7.0 comes with new options in the Send a Message, and Send a Webpage screens, to help you easily create special query parameters that can then be understood by using Google Analytics. with them, you can then keep track of visitors that originate from your mass mailings. In this blog post, I’m going to assume you’re familiar with Google Analytics, and using its UTM query parameters to create custom campaigns. But, if you’re not, check out the Google Analytics site, the docs on Custom Campaigns, the docs on Best Practices for Custom Campaigns, as well as Google’s own URL builder. So, let’s get to it! We’ll need version 10.7.0 of Dada Mail to have this feature available, so if you haven’t already, install or upgrade to at least v10.7.0. First, log into your list control panel, and make sure you’re on the Send a Message screen. Find and click the tab labeled, Options. Check this option to enable the feature itself. When it’s disabled (which is the default), none of the links in your message will be touched. 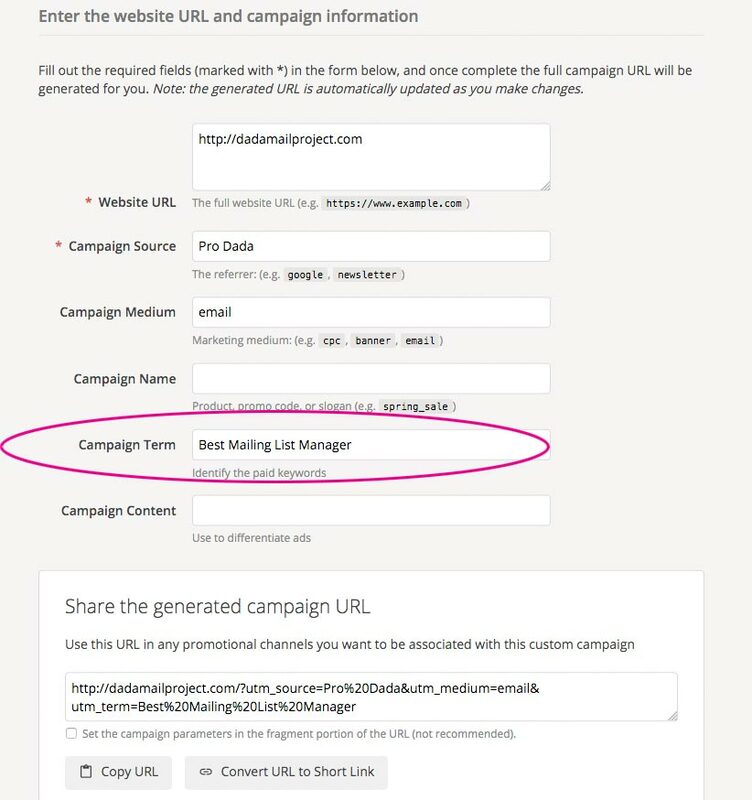 Dada Mail can add the custom UTM parameters to every link in your message, or only to links that go to specific domains. If you leave the textbox underneath this option blank, all links will have custom UTM parameters added to them. In the example above, I’ve enabled adding the UTM parameters, and I’ve listed two domains to add them to, dadamailproject.com and, dadademo.com. Don’t list these domains with, “http://” or, “https://” – just the domain itself. For a full description of what each of these for, see the docs I’ve linked above – start with this one which explains the custom parameters. For your convenience, we’ve set defaults for Campaign Source to the app’s name and Campaign Medium to email, so that right off the bat, any outgoing links you have you’ll know are coming from Pro Dada’s email messages! Campaign Term is an interesting one, as we treat it a bit special than the others. You may set a default for ALL links in the textbox provided, but Dada Mail will also do its best to try to find the text associated with the actual link click. This will report a Campaign Term of, Download and Install Today! You can then track which links work better in your mass mailings. In fact, all these parameters can be overridden in two other different ways. Dada Mail will keep the Campaign Term, Best Mailing List Manager instead of using the text that’s within your anchor tag, Download and Install Today!, or with whatever you set in the Campaign Term in the Analytics Tag. Options! Now, the Campaign term will be set by Dada Mail to, Give them the goods instead of, Download and Install Today! Any query parameters found in the link itself have the highest precedence. Finally, the parameters you set within the Send a Message/Send a Webpage screen will be used. 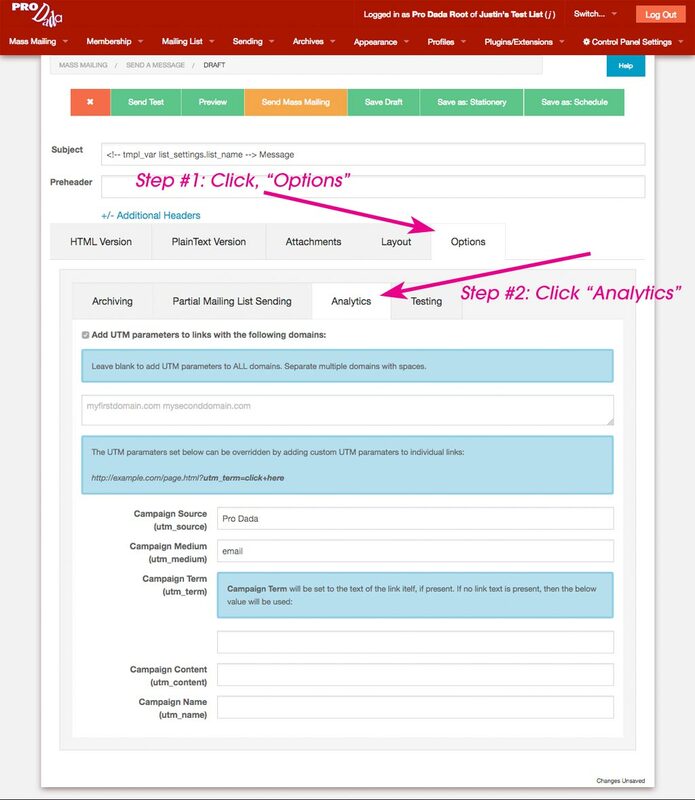 And that’s the new support for created the custom UTM parameters to be used in conjunction with platforms like Google Analytics. Give it a try, and let us know how it’s working for you. We’re looking forward on building upon this start of the feature and to add improvements over time!